Ambassador to US says Trump's Jerusalem declaration will go down in history alongside Cyrus' decision to permit rebuilding of Temple. Israeli Ambassador to the US Ron Dermer hailed President Donald Trump’s December 6th, 2017 decision to recognize Jerusalem as Israel’s capital and to relocate the US embassy from Tel Aviv, claiming it would go down in Jewish history. 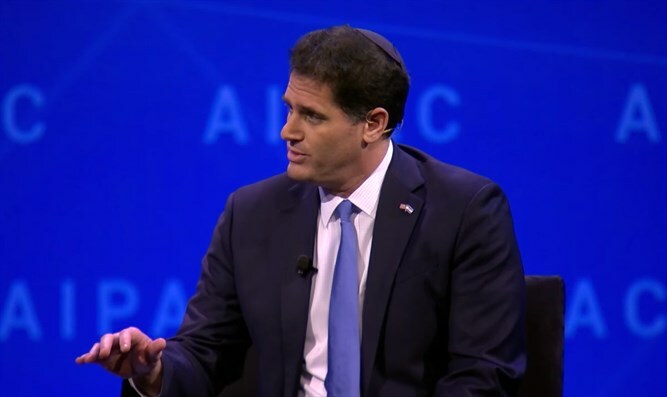 Speaking at the 2018 American Israel Public Affairs Committee in Washington DC Sunday, Dermer compared President Trump’s Jerusalem announcement last December to the decree of Persian king Cyrus the Great, permitting the Jewish people to return to Jerusalem and rebuild the Temple, following its destruction at the hands of Babylonia. Israeli supporters of President Trump’s decision to recognize Jerusalem as Israel’s capital and orders to relocate the US embassy from Tel Aviv also compared the US leader to Cyrus the Great, with the Mikdash [Temple] Education Center minting a special “Temple Coin” bearing the likeness of President Trump, alongside King Cyrus.